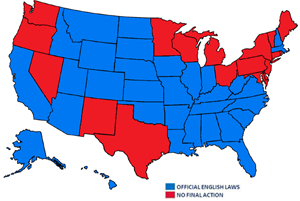 Declaring English the official language is essential and beneficial for the U.S. government and its citizens. Official English unites Americans, who speak 350 languages (2015, U.S. Census), by providing a common means of communication; it encourages immigrants to learn English in order to use government services and participate in the democratic process; and it defines a much-needed common sense language policy. A proposal in Congress to make German the official language of the United States failed by one vote. Official English does not restrict the rights of private citizens in any way. Official English would bar non-native celebrations such as St. Patrick’s Day, Cinco de Mayo and Oktoberfest. More than 90 percent (177) of the world’s nations have enacted an official language. Over the last two decades, support for official English and the end to bilingual education has been noticeable among immigrants.